The first to be featured this year is Stacy. Personal info....a very talented, young artist with a heart as kind as they come. All of her beauty and love of whimsy and fun is embodied in her art, which she cranks out with wild abandon. It is a joy to see all that she sees through her art and I am always thrilled by the truth that she paints. Stacy has the most amazing life story which you must read on her blog. It will give you an insight into why life holds so much promise everyday to Stacy. 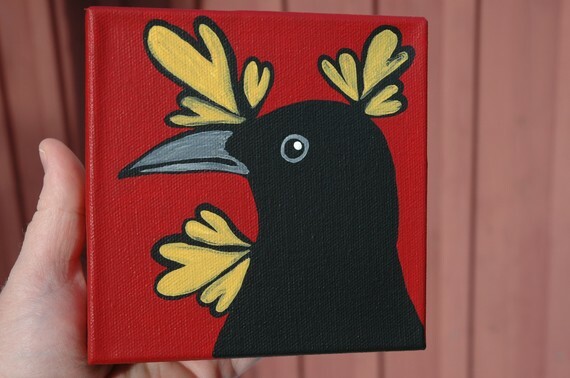 She says about her art, "It's funny sometimes, I sit down to paint a baby crow, let's saying dancing and what comes out is an adult crow in a nest. Whatever flows out of me, that's what I do. And, many of my paintings, come from my dreams too ;o)". Also on her blog she tells how important crows are in her life and why she paints them. Her blog can be found here. 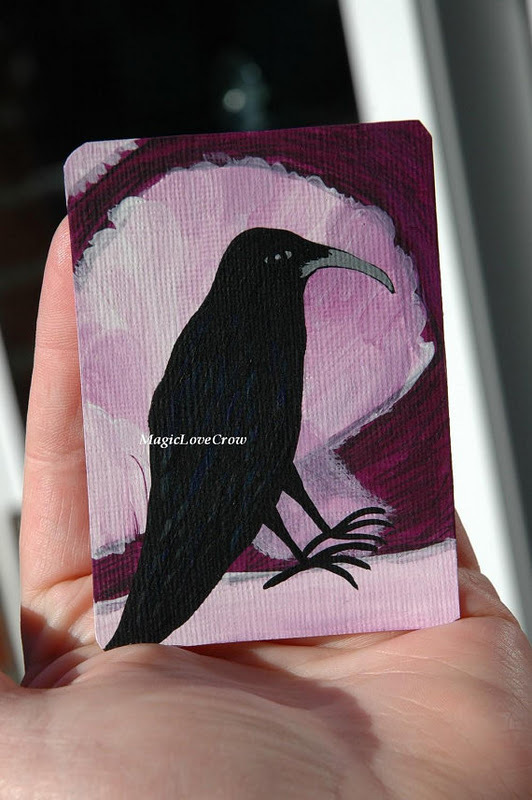 If you haven't been to see Stacy's work visit her at her Etsy shop Magiclovecrow. What's not to love about those adorable crows? Stacy's paintings are always fun and have such a light hearted feel about them. 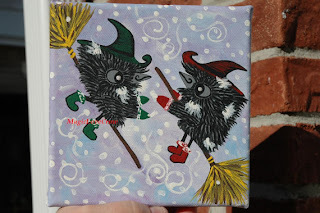 Her bold use of color and the cute little crows, what's not to love? Oh, another shop to check out. I love Stacy's whimsical and funny crows. They remind me of the "Crow Sisters" from Charles De Lint's books (which if you haven't read any of his work, he's a MUST!). Thanks for introducing a new artist. Stacy is so talented and I love her! What a wonderful post about her! I came over from Stacy's blog- great post! You described her very well. Linda, this is such a nice feature that you have done on Stacy. I just love her and feel that I have known her forever, when in truth we've never met. I am happy and proud to say that I own some of her wonderful crow paintings and I have just won the terrific cork that she painted...can't wait to receive it!!! Stopping by from Stacy's blog...you did a perfect feature. I am honored to call Stacy a friend and honored to have some of her art in my collection. Stacy is FAB..wonderful spotlight on her..she is a magical soul as well as all her love-crows! This is lovely, you hit this nail on the head. So wonderful to learn more about Stacy. Becoming friends with Stacy is one of life's greatest blessings. To know Stacy is to love her. There is only one Stacy "MagicLoveCrow" and I am blessed to call her my friend. Stacy is such a beautiful soul, and I feel so blessed to have several of her little treasures in my home! So glad you did this post on her...All the best Stacy! !